Directions: Spray into the air to help as a mild disinfectant. 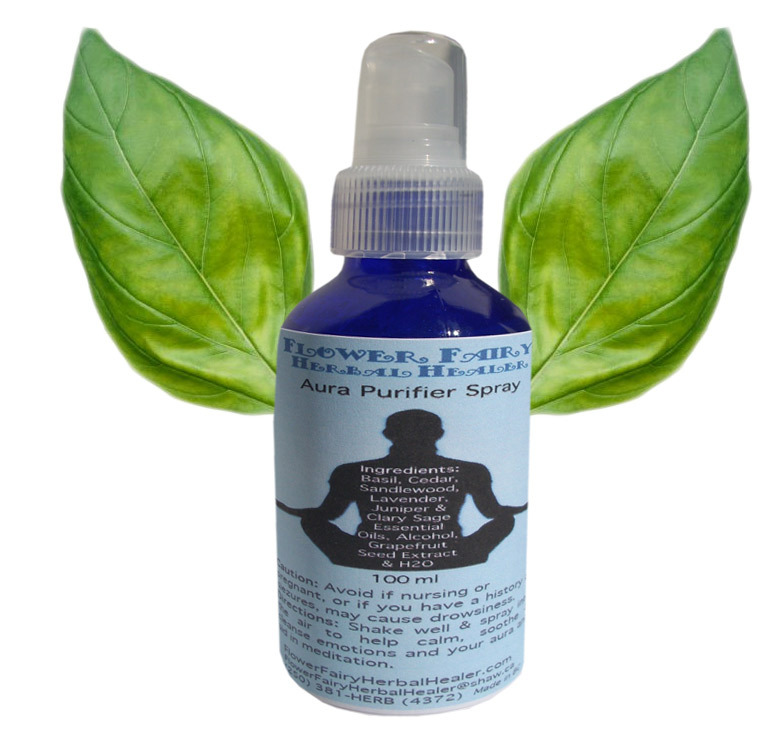 To calm, soothe, cleanse emotions, help cleanse your aura and aid in meditation. For spiritual cleansing, clearing the mind and negative emotions. Its essential oils have properties that include purifying and protective qualities. Increases some individuals' intuition and may make dreams more vivid. Ingredients: 100% certified organic, fair-trade, pure, natural essential oil of Basil,Cedar, Sandlewood, Lavender, Juniper & Clary Sage essential oils, alcohol, Grapefruit seed extract and distilled water. Used by Hindus who believe Basil protects from evil and cleanses potential bad energy. Used in colds and to help clean the bacteria in the air. Used to help with stress, headaches, tension, mental fatigue, promote sleep, and help nervousness. Sandlewood has a woody, exotic fragrance. This sacred smelling essential oil is found in Asia, and has played an important part of Indian culture in temple ceremonies, for relaxing, and achieving higher states of mind in meditation. Essential oil of Lavender is used to help stress headaches, calm, soothe, and has anti-septic qualities. It may help lift mood, ease nervousness, relax the mind and enhance sleep. Clary Sage calms the mind, eases stress, and may boost the immune system. May also help with PMS, emotional stress, nervous tension, and helps headaches. Juniper with a woody pine scent as far back as in biblical times, it was used for protection. Hospitals even burned it to help with the airborne epidemics of the 1800s. Native North Americans use it for spiritual cleansing, clearing the mind and negative emotions with its purifying and protective qualities. May increase some individuals' intuition and make dreams more vivid. Directions: Shake well, and spray into the air to help as a mild disinfectant, to calm/soothe/cleanse emotions or to help cleanse your aura and aid in meditation. What is an aura? Everyone has an aura. The aura is the energy field that surrounds all matter. Anything that has an atomic structure has an aura, an energy field that surrounds it. Atoms of living matter, that are alive; like people, plants and animals have more active vibrant auras. Atoms are made from electrons and protons and are electrical and magnetic energy vibrations. Since biblical times real plants, or natural plant based essential oils have been used to cleanse, protect and balance the aura/energy. From frankinscence to sage or sweet grass. Our's are organic and smell great! Caution: Cedar/Basil/Juniper essential oils can bring on menses so avoid if nursing or pregnant. Also avoid if you have a history of seizures. May cause drowsiness. Basil essential oil is to be avoided with those who have Epilepsy. Avoid driving or operating heavy machinery as it also causes drowsiness. May increase the effects of alcohol.